Couldn’t quite get our hands on any live bait, so we threw in some cut up bait in hope for some bumper bream. We instead hooked on to a rat king! (slang for the smaller specimens) at the 45-50cm mark. You might be able to make out the circle hook that is still on the corner of its mouth. The brilliant thing about the way circle hooks are designed is that it does least possible damage to the fish yet it doesn’t seem to lessen the strike rate. You need to be a bit more patient with the circle hooks though, as they are designed for the fish to swallow completely and they’ll hook themselves on. A warm Spring day and there were plenty of bait fish about to keep us busy. We launched a few for live bait with not much luck but remained patient and hopeful. After a decent half hour wait, we were on! The line was peeling off the reel at a rapid rate which suggested a king. Fortunately it was on the big rod. After a decent 10 minute fight, we brought up this monster, fortunately we had a solid net with us to bring it in. It measured around 67cm. 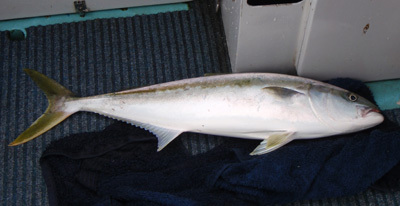 This is what everyone who fishes strives for, to tackle the elusive kingfish. 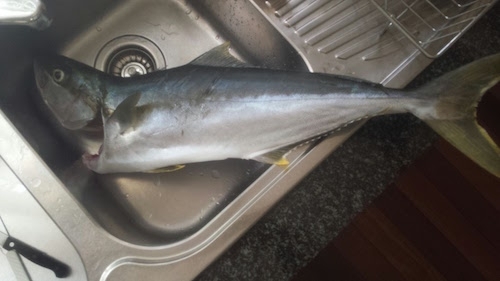 They make an appearance in many stories of “the one that got away” due to their fierce nature, their ability to straighten hooks and tendency to bust your lines on the reef. Throw in with that, the challenge of fishing from land, and we have the ultimate fishing achievement. This specimen was hooked by my dad. A live bait was put out and after only a few minute wait, the rod went off! We fortunately had enough drag backed off for it not to take the rod in. Some twenty minutes later, with a mixture of adjusting drag, keeping an eye on the line left on the reel and avoiding anchors, we land our first legal kingfish! Towards the end of the day, my brother was able to snare a pike by winding his live bait in slowly. All in all, a fantastic day out. For the keen fisherperson, I would recommend going out on a charter at least once in your life. Although, remember to take some travel sickness pills, as my girlfriend and I were vomiting for the good part of a few hours while we were out there!